Let's face it. We've all had that student that just doesn't know where their body is supposed to be in the classroom. 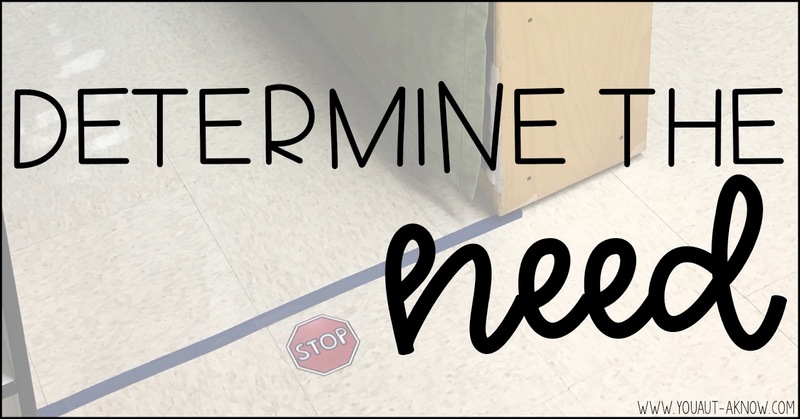 We've tried TONS of interventions, but they still seem to wander around the classroom and you need to find a way to keep them in the correct space. For our visual learners, visual boundaries can be super helpful. I have used them in a variety of settings and in a variety of ways. 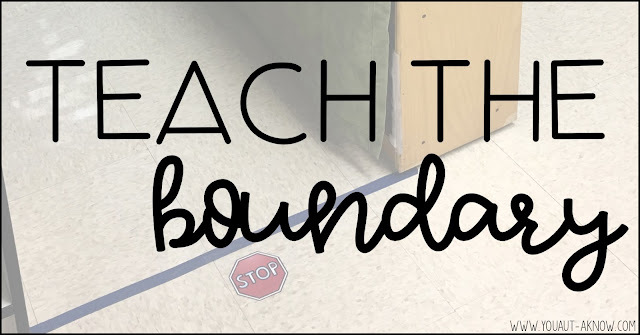 Before I show you what I've done, I want to talk just a little bit about when you're going to want to use visual boundaries with your students and what things you may want to consider before implementing a visual boundary system in your classroom. 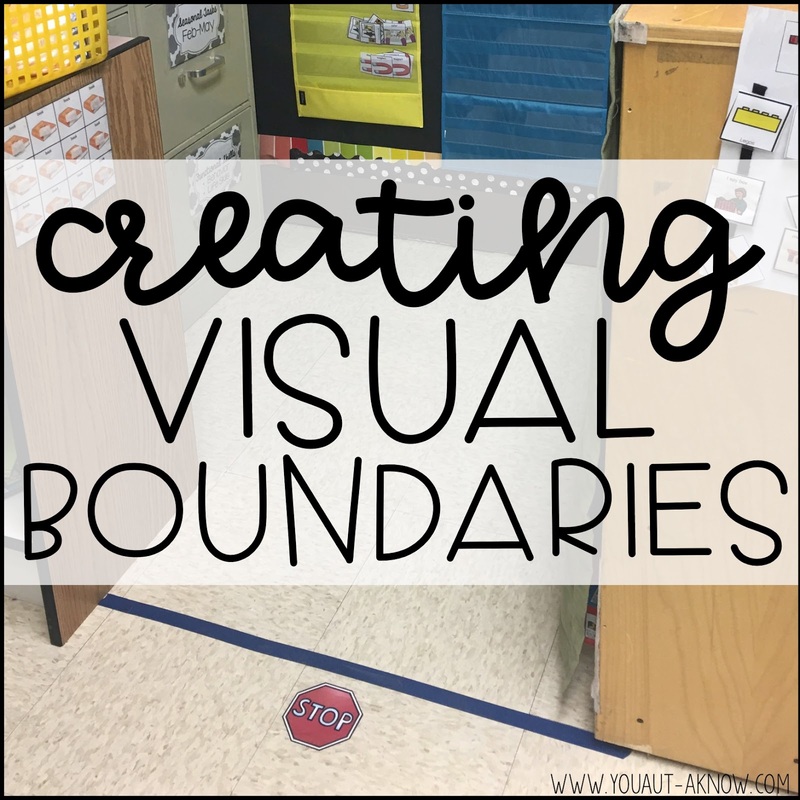 The first thing to consider is why you want to implement visual boundaries in your classroom. I mean, us special educators have all the free time to put in all the interventions in our classroom *kidding*. So it's important to think about WHY you need to use this intervention. If your students are able to stay in designed spaces and do not elope or invade other spaces, don't create extra work for yourself. 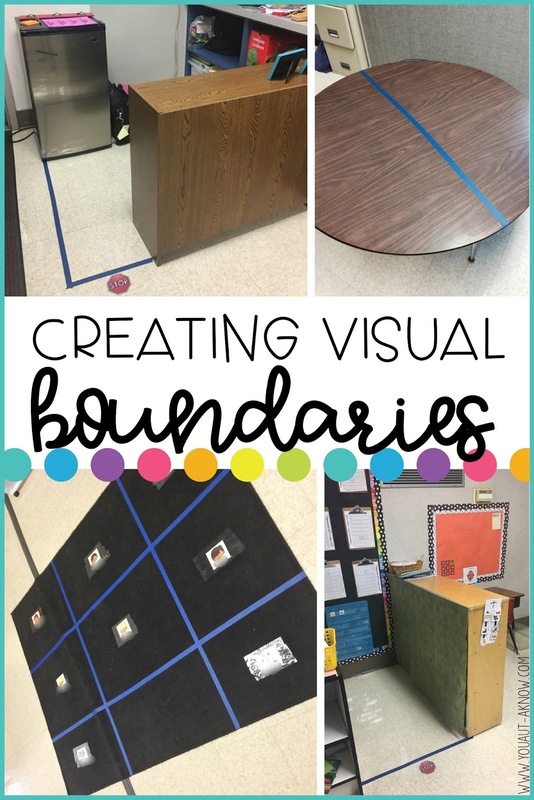 But if you have students (like mine) who wander the classroom and invade "teacher spaces" to investigate, you may want to think about implementing visual boundaries in your classroom. You can see that I have place the names of students in the spaces they are expected to sit during our classroom center times. I have also blocked off the two teacher spaces in my classroom by using painter's tape and a stop sign. This show students that they are not allowed in those spaces. The table visual shows how I designate personal space in the classroom. This is a shared table in our play area. Often times, students will sit on top of each other and leave the rest of the table completely empty. This piece of tape shows students where each student can play at the table. There are tons of visual boundaries you can set up in your classroom, too! I have seen the use of vinyl spots to designate where students are to sit. I have used painters tape on the floor to designate where a desk or chair is supposed to be for students who end up with their desk and chair miles apart in the classroom. Visual boundaries are great in the classroom, but they're not magic. Setting up visual boundaries is going to require you to do some teaching with your students. Once you have set up the boundaries you need to teach your students what those boundaries mean and how to access them in the classroom. 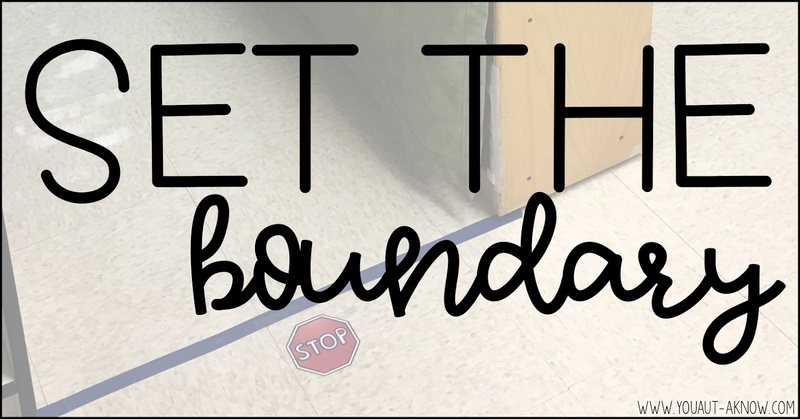 I teach my students to use boundaries in the classroom by using a reinforcement routine. When students are inside the boundaries, I will reward them with a reinforcer and state the boundary expectation (example: "You're in the book area." paired with the reinforcer). It is important to start with a short time duration when you begin reinforcing the behavior that is expected. It is not abnormal for my staff and I to reinforce students for being in once space in the classroom every 30 seconds when we begin teaching visual boundaries to students. When students leave the boundary or invade the space that has been visually blocked off, we simply redirect the student back to the space they are supposed to be in and state "It's time for X". When students are back in the established boundary we continue to reinforce the expected behavior. The most important piece of this teaching strategy is to BE CONSISTENT! If students are expected to be in one space, it is important that all staff redirect and reinforce consistently. This will help students understand what is expected while they are in the designated spaces. We are special educators. 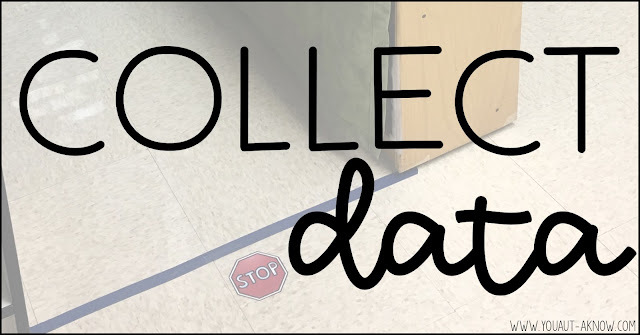 You better believe that every teaching plan comes with a data collection system. When I am teaching boundaries to a student, I use frequency data to track how many times a student leaves the boundaries. If we see a decrease in the data, it is safe to say that our students are learning how to stay in the designated spaces in the classroom and my staff and I can celebrate our hard work! 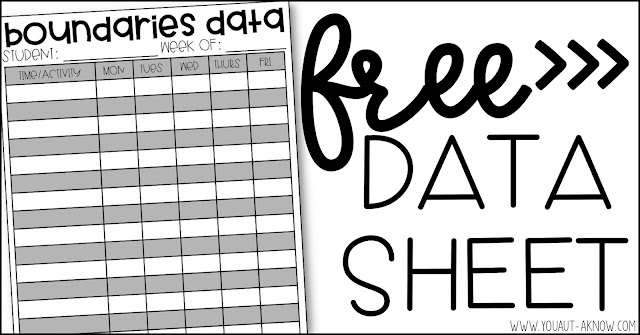 Need a quick data sheet? Grab this FREE (and editable) one! 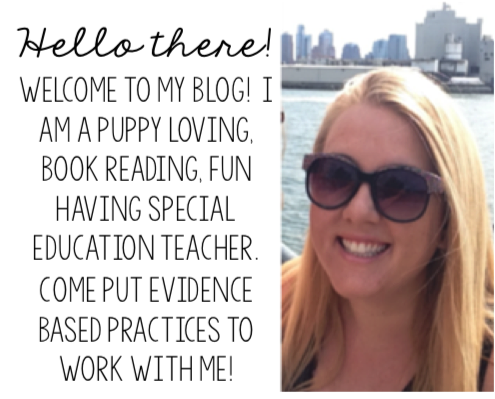 How do you use visual boundaries in your classroom? Drop a comment and let me know!